Here’s my take on what’s trending for 2017 based on what I’ve been seeing in the shelter magazines and reviews of Spring High Point Market.Art Deco seems to be upstaging the industrial look that’s been so popular the last few years. To that end, the glamour of the 20’s and 30’s is influencing furniture design in a big way. Art Deco just happens to be one of my favorite styles – the combination of geometric forms, rich colors and expensive materials is so very chic. This gorgeous bar cabinet by Michelle Workman is just such a piece. Designed for French Heritage, the Astaire Bar Cabinet from the Facet Collection is featured in Midnight Lacquer with brass trim and hardware. It has a lighted mirrored interior, as well as a center pullout for drink preparation, which adds to its functionality. I think it’s a showstopper! From the runway to the interior, fashion design brand Badgley Mischka introduced a gorgeous line of furniture for every room. Very “Hollywood” glam, I am IN LOVE with this chair. And the rest of their collection is just as fabulous! Organic Luxe is another interesting trend that moves me. 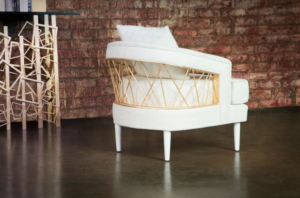 Furniture designers are using natural shapes juxtaposed and contrasted with rich metallic finishes. Fossilized shells and petrified woods have a real, down-to-earth feel but are augmented with bronze, gold, and silver giving them an elegant edge. This stunning Handley Drive Twig Cocktail Table has real branches, leaves and buds cast in solid brass and artistically arranged to create a large dramatic and purposeful cocktail table that will fit into a multitude of design styles. 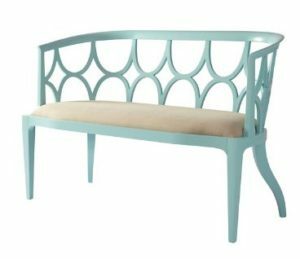 Bench from Theodore Alexander would be a fun addition to any room. Similar to the circle on the Astaire Bar Cabinet, this beautiful console from Bernhardt’s new Domaine Blanc collection has these stunning nickel circles. Actually, I love the entire suite of neo-traditional furniture in this collection. The pieces have a Dove White finish on sandblasted oak veneers embellished with tarnished nickel and white quartz. Many companies are offering new introductions with white and cream finishes—but not lacquered, cerused or limed finishes, which are very on-trend. A cerused finish highlights the contrast between the grain and the rest of the surface—an organic feel, but in a classic style. In contrast to white, blue is a top selling color this season. Bradington Young has this gorgeous peacock blue leather shown here on a sofa. From calming azure to deep navy, you’ll find varying shades of blue upholstery, window fashions, rugs, wallpaper and more. Of course, blush pink is still very popular. This fabulous bench by Tobi Fairley for CR Laine was from two markets ago but would be at home in any current décor. I’d love to show you how to incorporate these trends into your spaces. Please call to find out how we can create your cozy home!